The final two weeks of the 2018 Asia Trail Master Championship series but still four points races to go. On Sunday, the new COMPRESSPORT Trail Blazer in Singapore and the traditional CM50 Ultra in Philippines will already shed a big light on who the ultimate championship challengers are this year, and -who knows- maybe it will all be decided already! Both points leaders in the championship will be running, too, albeit with different motivations. Ruth Theresia has accumulated such an advantage over the other women by winning three back-to-back races in Indonesia in September and October, only a mathematical possibility remained for some other race winners of this season to still overtake her on points. But time has run out. Carole Fuchs will be doing Izu Trail Journey on 9 December, but that won’t be enough to catch Theresia. Corinne Williams has decided to end her season after Borneo TMBT Ultra due to other life commitments. Singapore’s Evelyn Lek - who burst onto the scene by winning both Magnificent Merapoh Trail 100 and Vietnam Mountain Marathon 100 - will compete in her home race this Sunday, but even if she wins it and follows up with Izu and HK 168, she cannot reach the 2650 total points tally set by Ruth Theresia. The leading lady of the renowned Bandung Explorer Team can therefore rest on her laurels and enjoy her second participation in CM50 Ultra supporting her friends. Ironically, exactly one year ago, Ruth lost her chance to become ATM champion in this same race after a great battle with Kim Matthews. While Ruth has emphasised not to look for her at the front of this weekend’s race, another finish would mean her 16th Grandmaster race finish! At the end of 2018, she is the only runner who is a 3-Star Grandmaster! Who can we expect to compete for the race victory in Clark? Plenty of good local athletes on the start list, such as Aggy Sabanal, Melanie Hingpit, Ann Pulanco and Khaterina Visperas. Sabanal, who is also scheduled to run in Japan in 2 weeks, will be eyeing the first runner-up position in the ATM Championship behind Theresia. In addition, there is the in-form Malaysian Jassica Lintanga. The Sabahan runner will aim to score another podium - and who knows a first ever ATM points race win - and in so doing cement a top five ranking in the 2018 ATM Championship. The men’s race in Clark will see Manolito Divina in action for the second time this season after his comeback on the ATM tour in Plataran X Trail Bali. He will be competing against tough guys like Spaniard Ander Iza Rekakoetxea, and other Filipino top runners such as Jared Teves, Joeffrey Camara, Ray Cabanig, Arnold Lozano, Aleksis Capili, Kyle Antolin and Felmer Hiponia. In the context of the ATM Championship, eyes will be cast on Japan’s Tomohiro Mizukoshi first and foremost. He is ranked second behind Sherpa, and still has potential to challenge leader Alessandro Sherpa on points by improving on his ‘worst’ results of the season. Mizukoshi is currently 210 points behind, but a win in CM50 could reduce that gap to 110. And in 2 weeks there is his home race, Izu Trail Journey, where last year he ran very well, too. More runners to watch out for in Philippines are Sungsik Joh and Kristian Joergensen, the Manila-based Dane, who ran a fantastic Borneo TMBT early September. A Joergensen in that kind of form will be a serious contender for the race victory in Clark as well. 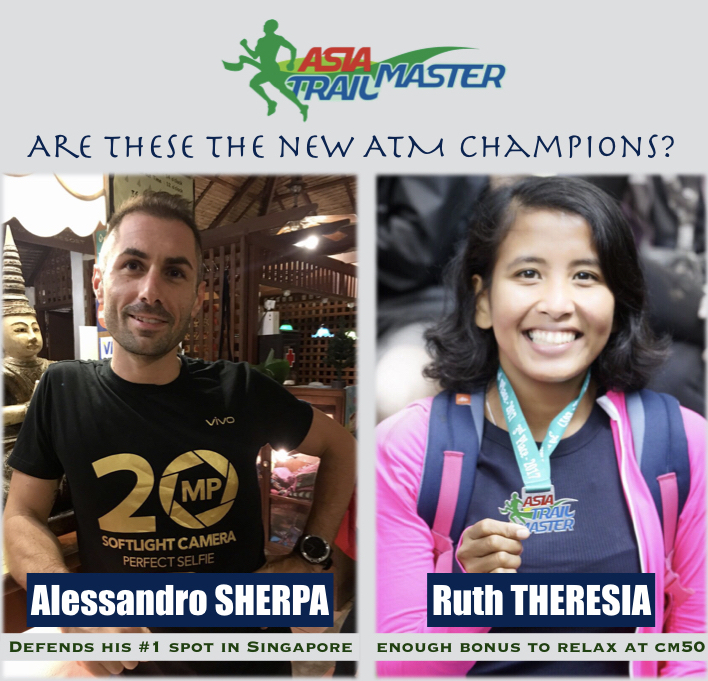 While Mizukoshi will be trying to catch up with Sherpa, the Italian himself will do his utmost to further increase the gap in the new Trail Blazer race in Singapore. Previously Sherpa had announced an end to his season to allow his injuries to heal properly, but he clearly feels his points margin is not wide enough to sit back and relax. Attack is always the best defence, as they say in sports. 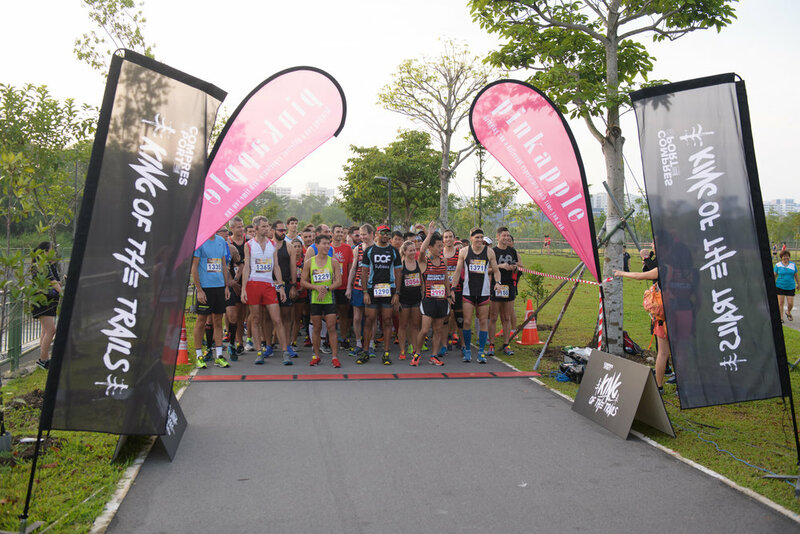 The name of the Singapore race is not a coincidence: the 25 km will be very fast for a trail race, of course aided by the fact that the nation state does not have any serious elevation gain to speak of. Sherpa has a great running speed, but how much will his knee and ankle hamper him? In addition, Spain’s Salva Rambla will be giving him a run for his money, too. Rambla himself is not entirely out of the Championship neither, especially should he win this Sundays’s Trail Blazer. Furthermore, in an atypical and non-technical trail race like this one we can expect several road runners to appear who may upset the normal order of things. In any case, while Ruth Theresia can prepare for a big celebration party on Sunday, Sherpa is unlikely to find himself in that situation already. Red Dot Running Company supports Asia Trail Master! We are pleased to announce the support of Singapore's Red Dot Running Company for this year's Asia Trail Master Championship series. The brain child of Asian ultra legend Jeri Chua, Red Dot Running Company aims "is aimed at becoming a focal point for the running community in Singapore, starting with the trail and ultra runners who will always have a special place in our mountain-loving hearts". RDRC works closely with niche brands that are born from sheer passion, looking to provide aspiring adventurers with the perfect kit. In addition, Red Dot Running Company wishes to showcase the work of local and regional photographers, and the incredible trails we have in the region. Runners from Red Dot will be taking part in several Asia Trail Master races this season. To find out more about RDRD, approach the runners on the tour or visit the website here. 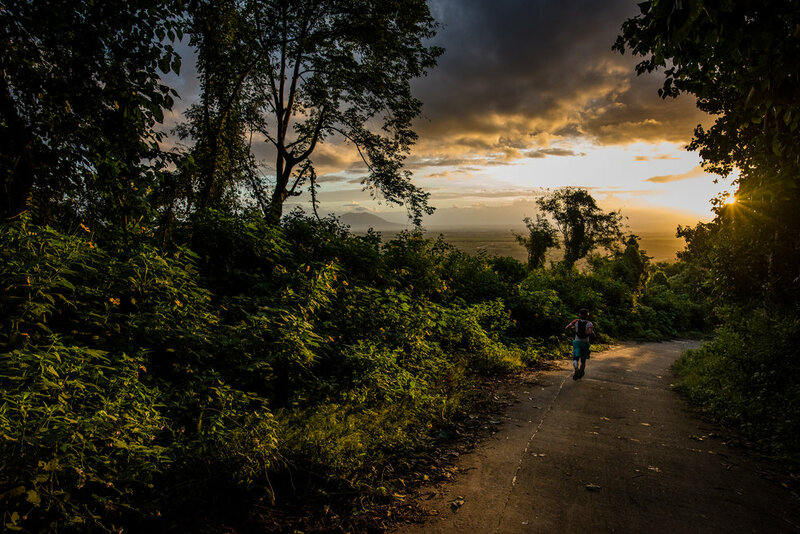 One of the protagonists in our inaugural Asia Trail Master series hails from India. 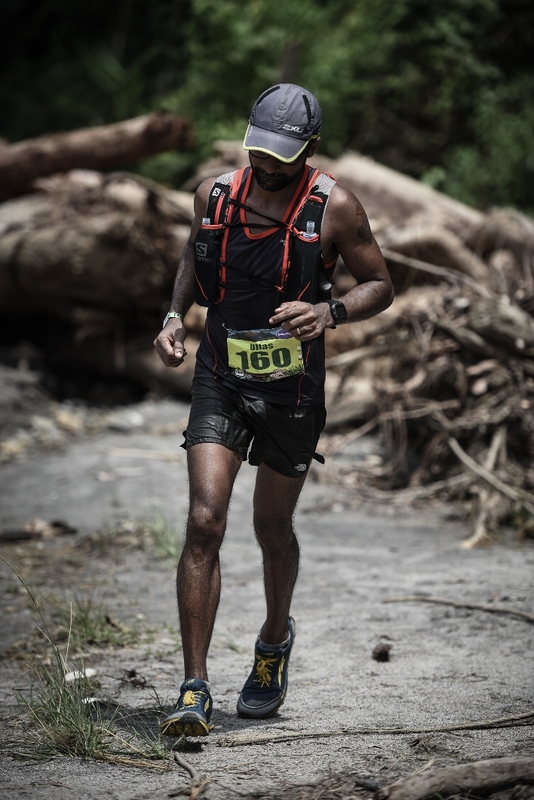 Ullas Narayana has had a strong summer with an 8th place in the grueling Mount Rinjani Ultra in Indonesia early August, and a fantastic 2nd place in Colorcoil Borneo 100 TMBT in Malaysia just a few weeks later. In addition, he scored top placings in a couple of races in his resident country Singapore. Narayana currently ranks fifth in the Asia Trail Master ranking with 732 points and next weekend takes part in his first 100 miler, Bromo Tengger Semeru, where he will again challenge race favourites Arief Wismoyono and Jan Nilsen. First, please tell us a bit more about yourself, where you come from,what you do and what brought you to Singapore? Hello. My name is Ullas. I grew up in Bangalore, India. After graduating in Australia I found work in Singapore as an animator for Lucasfilm Singapore. I have been here for 11 years and live here with wife, 2 kids and our puppy. You only started taking part in trail competitions not so long ago. When and why did you decide to start? What is so great about trail running? I decided to get back into running around the same time I started a family so I could be in good shape and be a good example to my kids. I should thank my friend Nigel and my wife Annie for encouraging me to sign up for my first race since college. That was a bit over 3 years ago. I enjoy running be it on roads or trails. I like trail running because it requires me to be more aware of my surroundings, to be more present on my runs. Other reasons why I like trail running .. the solitude, nature, the low key races, the list goes on. Endurance running suits me at this point in my life. Sport in India means cricket. Or how would you define sport in India, and does running take an important place in people's lives? There is a very active sports culture in schools and colleges in India. Growing up we played a large variety of sports. But sadly everything ends in Cricket. There is a lack of funding and support for athletes I believe. Maybe things have changed. I haven't lived in India for quite some time so I don't know what the current attitude is. But it seems running is catching on as a form of exercise. What made you take up running? My father took us running every morning. So the love for running started early. We were in a swim club. Had tennis lessons. He made sure we were active kids. I briefly had a running coach. Then high school took over. I didn't pick up running again until college. I had a bit of success running middle distance in college. I have been running on and off since. Running has always been a part of who I am. Not really. Every time I race I find bits of heroes in people I compete with. There's a number of trail races in India, but they have not really become part of people's conciousness yet. Are there any events we should be aware of? The Bangalore Ultra and Kaveri Trail Marathon in the state of Karnataka are gaining popularity. Others I know of are the Oxfam Trailwalker India, Nilgiris Ultra(its mostly road but beautiful) and the LA Ultra. How is life in Singapore for you? Life is good. I wish there were bigger hills. What sort of training do you do to become a competitive trail runner? Singapore is flat, but you also do well in mountain races. At the moment I run 5-6 times a week. Lots of hill repeats where ever I can find them. I try out different workouts which I read about. I average 120-160km a week. I also make a lot of time for beer. You came eighth at MRU and a superb 2nd at Borneo 100 TMBT. What was the difference in those 2 races for you? MRU was a good first experience for the climbs and descents. I was out there longer than the 100k races I have run. TMBT was very runnable, which I like. With hindsight, what would you do differently to beat Daved Simpat and win TMBT? Exercise a little patience at the start and not get lost. Save a little bit of something for the very end. Have you ever run a road marathon (42.195km) and what was your time? I ran a road marathon in July. It was less than a week after a trail marathon. My time was 2.53. Your next big race is a 100-miler in Indonesia: Bromo Tengger Semeru (BTS). What are your ambitions? To finish. Its my first 100 miler. I just want to get a feel for the distance. I hope I don't end up a mess as I can get competitive come race day. Dealing with the heat is a key aspect for elite trail running. Would you say that being Indian you are used to the heat, or how do you cope with it? Do you drink a lot during races? I grew up in a temperate climate but living in the tropics for a decade has helped. Yes, I drink a lot during races. I get dehydrated quickly. My ancestors spent their days out in the fields. So I guess genes help me out a little. In your opinion, what are the biggest issues facing the sport of trail running in the near future? What would you like to change or see happening in terms of development? Not having enough trails. Being based in Singapore I am always concerned over the battle between nature and development. Many trail running event in Asia seem to compete with each other to obtain the title of "the toughest race". Do you mind or would you rather see more trail races that have more 'runnable' courses? Doesn't bother me. I can always pick the ones that suit me. What do you think about the Asia Trail Master series? Could this be a goal for you in 2016? Its exciting for someone like me new to the trail running scene. I can easily find out about all these cool races in the region. I like that so many countries are represented in the series. While we are spoilt for choice in the region not everyone has the means to access these races either for the experience or for gaining points. Ullas (and Regis Cabaret) during Borneo 100 TMBT last August.